Read more Wine Opener with Natural Ebony Wine Opener with Natural Rosewood Wine Opener with Natural Olive wood Wine Opener with Ebony Wood Inlay Wine Opener with Natural Gall Wood Wine Opener with Natural Rosewood Wood Natural Ebony Natural Rosewood Natural Olive wood Ebony Wood Inlay Natural Gall Wood Natural Rosewood Size 4.7 * 1.4 * 0.5 inch 5.5 * 1.5 * 0.7 inch 5.5 * 1.5 * 0.7 inch 4.8 * 1.0 * 0.5 inch 4.8 * 1.0 * 0.5 inch 4.8*1.3*0.6 inch Weight 3.5 oz 8.0 oz 6.6 oz 4.4 oz 4.4 oz 3.9 oz Hinge Double Hinged Double Hinged Double Hinged Singe Hinged Singe Hinged Double Hinged Beer Bottle Opener ✓ ✓ ✓ ✓ Polishing Process Dull Polishing Bright Polishing Dull Polishing Dull Polishing Dull Polishing Bright Polishing 420 Stainless Steel ✓ ✓ ✓ ✓ ✓ ✓ Double Corkscrew ✓ ✓ ✓ ✓ ✓ ✓ Foil Cutter ✓ ✓ ✓ ✓ ✓ ✓ Read more All-in-one Multi-function The 3 in 1 multi-function corkscrew has the features of a wine corkscrew, bottle opener and foil cutter all together in a stylish and durable 420 stainless steel body with comfortable grip natural handle. The waiters key as the waiters friend is the size of your hand and fits right into your pocket. The perfect tool for wine lover, waiter and bartender. Easy to Use Corkscrew This wine opener is excellent for daisy use. The more you use, the better it gets. You will be able to remove even the longest wine works in seconds after you learned the mechanics behind the double-hinged fulcrum. 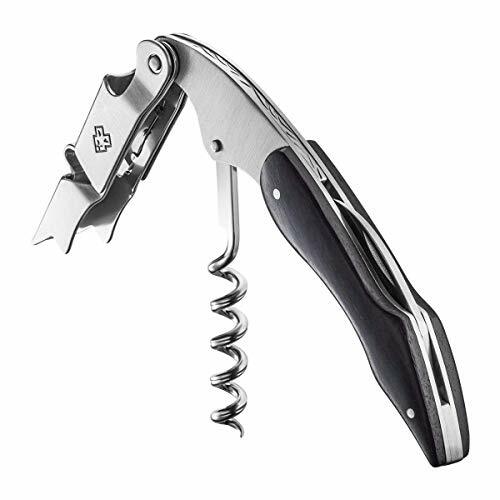 All you need to open a bottle of wine or beer is just this one tool. Natural Ebony Handle Ebony is a deluxe wood with a deep black coloring and it is regarded as a very high natural shine. The features of tough, colorfast, bug-repellent, anti-aging, excellent strength and hardness make it an "eternal tree", which gives you the feeling of handle. Double-Hinged Fulcrum for Extra Leverage The double-hinge fulcrum provides extra leverage and smoother pulling of even the longest corks.The two step hinge makes opening wine twice as easy by allowing for a nice, 2-step pull and removal of the cork and offers a significant mechanical advantage over older-style single-hinge cork remover.